I’ve been thinking a lot lately about “perfect” pieces. Probably because I’m tired of gazing listlessly into my closet for (what feels like) hours on end, being overwhelmed by a sea of “fine” – rows of options that are overplayed, uninspiring, or just not quite right for one reason or another. This entry was posted in dress and tagged alice + olivia, helmut lang on 24 March, 2014 by shoppingsmycardio. i’m so very glad to see that all of that gorgeous (but severe) pleating from last fall has transformed into piles of soft draping and grecian-inspired looks this year. besides looking sophisticated, soft and effortless, all of those flowing pieces translate to some seriously perfect camouflage just where you’d most want it. even though i’m dreaming of the positively perfect version from derek lam’s fall collection, shopbop has very lovely (and much more budget-friendly) options, so i thought we’d indulge in a little tour. since my life is less packed with cocktail parties and late-night outings than you’d think (ha! ), these lovely grecian tees are far more likely to make my fall must-have list. kain’s version (left, $93) is about as perfect as i could hope for – i even love the color. but i’m always a bit skeptical of the one-size-fits-all tee. the style from monrow (right, $88) is one i think i’d have to see in person…i can’t quite decide if all of that draping on the front is flattering or maybe a tiny bit sloppy (particularly in the boysenberry shade i’d be most likely to fall for). i’m guessing it’s all in the fit, as usual, and i do think this one has serious potential. just remember, the trick with drapes is a goldilocks kind of thing. too few, and the look is messy, not draped. too many, and that camouflage turns into serious extra baggage. and definitely keep those folds from piling up in the tummy area! you want the look to be light, flowing and (seemingly) effortless…and, naturally, slimming. so, will you be indulging in a little grecian inspiration this fall? 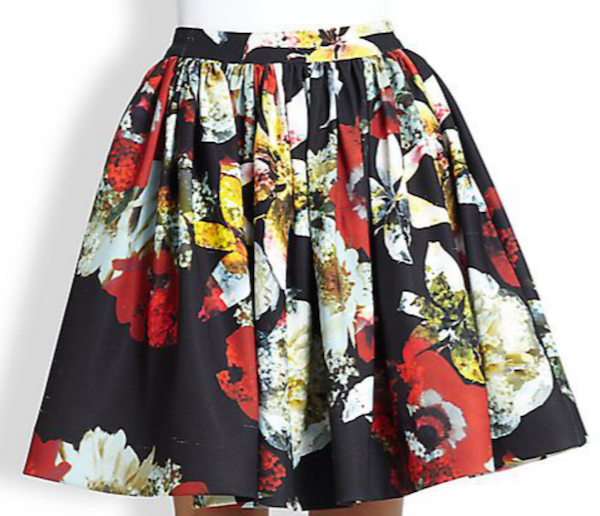 This entry was posted in fall, fashion and tagged alice + olivia, derek lam, kain, monrow, rachel pally, shopbop on 31 August, 2009 by shoppingsmycardio. a little confession: i’m loving this economic slump, if only because we’re getting great deals from stores that are generally notoriously stingy with their discounts. now through sunday, take 20% off any and all jackets and sweaters at shopbop with code SHOPBOPSECRET. since i’ve been lusting after some new outerwear since i first saw the fall runway pictures, i’m viewing this as a sign from above that it’s time to invest. i hardly know where to begin. 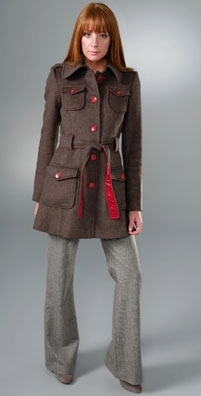 i love the structured, military styling on this overcoat by alice + olivia, and that flash of fuschia on the belt and buttons is a perfect touch of color for drab days. 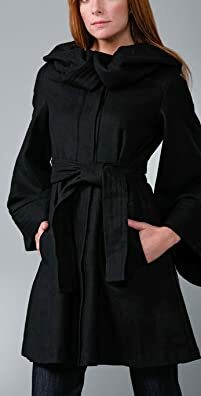 but i’ve been after those amazing exaggerated collars since day one, so i’m pretty sure this amazing black felt trench from dolce vita is going to win this time (especially since it’s only about $250 with the code!). shopbop has the best coat selection i’ve seen this fall, hands down – and a really broad price range, which is a nice feature in this category. the sweater options are a little more challenging for me – unlike a coat, there’s no way i can tell myself i only need one. i look forward to fall all year long – you can take your sun and surf, i’m a sweater girl at heart. this slouchy v-neck is the ultimate weekend sweater, and one i know would spend very little time in my closet. for the week, there’s one 80s trend i’ve been embracing with gusto: the sweater dress. simple, chic, and perfect for fall, my closet will be filled to the brim with these by january. i’m starting with this charcoal wrap dress from DVF, which is classic enough to survive the trend, and cozy enough to remind me of my favorite cardigan. whatever you’re after for fall, now’s the time to max those credit cards – code SHOPBOPSECRET is only good until sunday! This entry was posted in coupons and discounts, fall, fashion and tagged alice + olivia, coats, diane von furstenberg, dolce vita, DVF, jackets, shopbop on 24 September, 2008 by shoppingsmycardio.